Polemonium (Polemonium- Blue) - This perennial flower can be grown from Polemonium seeds and has the common name of Jacob's Ladder. The name was inspired by the leaves on the plant which are in successive pairs opposite each other resembling a ladder. It has attractive fern-like foliage that is arched and creates dense mounds from which blue flower spikes protrude upwards. The Jacob's Ladder flowers are in clusters and are bell-shaped in various shades of blue with contrasting bright yellow stamens. Very striking! 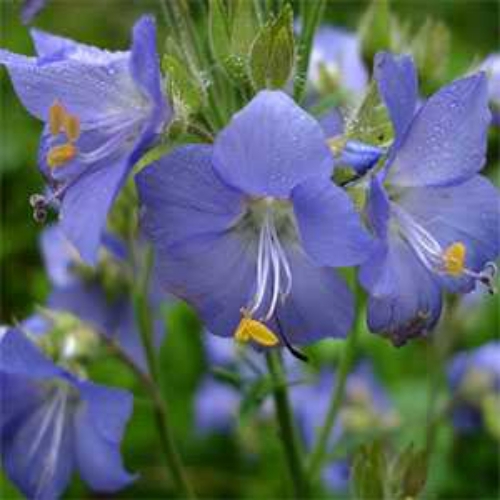 Polemonium Jacob's Ladder requires good soil drainage as well as full sun to partial shade. The foliage blends well with hostas, bleeding hearts and lilies. Many people believe that the Jacob's Ladder herb can be used for a remedy for headaches, nervousness, and heart irregularities. More research is needed in this area. How To Grow Blue Jacob's Ladder: Sow Jacob's Ladder seeds indoors 6 - 8 weeks before the predicted last frost date or directly outdoors after frost season is over and night time temps are warm. Surface sow Jacob's Ladder flower seeds on good seed starting mix, gently pressing the herb seeds into the mix and lightly covering. Moisten the mix and keep it moist until germination begins. Light is required for best germination. When the seedlings are established, prick out each seedling as it becomes large enough to handle and transplant into 3 inch pots. Gradually acclimatize the Jacob's Ladder seedlings to outdoor conditions for 10 - 15 days before planting out into their permanent positions, space 12 - 18 inches apart. Jacob's Ladder care includes deadheading spent blooms to prolong bloom time.